Plain speaking and common sense have always been a part of how we go about doing business. Whatever we communicate will be clear and honest. Our products are genuine, make good sense, and are practical. Using them provides worthwhile benefits. Leather is skin and needs care and protection given to it by its “owner.” We believe investing a small amount of money and effort to get the very best comfort and long term use from your boots and shoes, is good common sense. There are a lot of leather care products to choose from. There’s no shortage of claims, promises and hype to sift through. We believe AQUASEAL products are the best options. On this website we present our “case,” but know and respect you’ll judge our products on how they perform and satisfy your needs. Once you’ve tried AQUASEAL we’re confident you’ll join the legion of customers who make AQUASEAL part of their routine. Leather needs help. With your help, AQUASEAL comes to its aid. The labels are printed in the U.S.
We’re paying a lot more attention these days to buying American because doing so supports the betterment of our economy, and creates American jobs. When we buy products made in America we invest in our country’s future. We keep American dollars in America, and help reduce the large trade deficit. 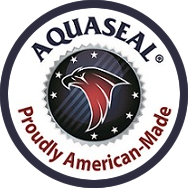 AQUASEAL has complete control of product quality from start to finish. This assures ultimate user satisfaction. With 100% quality control you get consistent, trustworthy performance. The USA has standards, regulations and requirements to protect consumers from potentially harmful ingredients.